Celebrating Songkran in Chiang Mai can lead you to a new level of enjoyment. You can have the most fun there. You may find the longest and biggest parties in Bangkok, but you can find the best water fight in Chiang Mai, which makes the Chiang Mai one of the most popular places in Southeast Asia. Visiting Chiang Mai in the middle of April can bring a hell of fun. According to Thai custom, getting soaked during the celebrations of Songkran can bring the blessings to you for the coming new year and all of your sins and bad luck of the previous year can be washed out with a stream of water. So, if you are thinking of visiting Thailand, for the celebrations of Songkran Festival, you must think about to plan for Chiang Mai. Commonly, Songkran is being celebrated throughout the city in Chiang Mai, either you are somewhere around Thapae Gate enjoying walk along a small lane or at any place outside the town, people have their water guns and water buckets ready at every place. The most popular places that you can visit during Songkran Festival celebrations are the canals, the moat, the Ping Rivers and some of major places for example Chiang Mai Gate or the aforementioned Thapae Gate. Absolutely join in the crazy water fighter! Thapae Gate is known as a major entrance to the old city of Chiang Mai, and you can find this are literally covered with water during the celebrations of Songkran Festival. You can find the biggest water fight at this pace that you may never seen before. You can find each and every person including men, child, Thais, Foreigners and old, everyone is throwing themselves into a water fight to enjoy. You can find multiple stages there, which are organizing different events and competitions and people are taking part in those competitions. You can see the people wearing colorful Thai costumes there. And you may find drinking restrictions in this area. Long road next to the moat you can find really lively where you can enjoy water fight with lots of fun. But be careful while enjoying a water fight and do not let the water into your eyes, mouth and ears. It is because, water people use to throw on each other you do not know where it is from. Local brands may fill the air with beautiful music that can add fun to your enjoyment. And different stalls around you can give you a chance to buy and eat delicious food and you can find cloth sellers there too around the road. 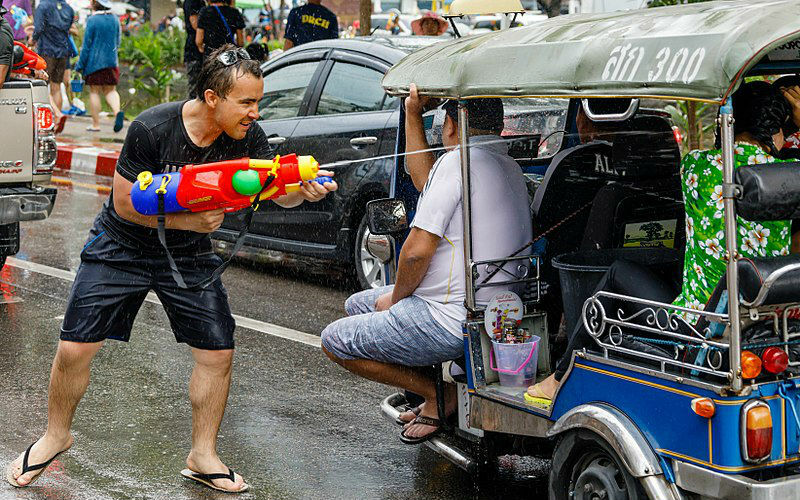 If you want to be a part of water fight during the celebrations of Songkran Festival but do not want to walk, a tuk-tuk ride can be a better option for you. you can take a tuk-tuk ride to experience the street water fight in Chiang Mai and may get wet, but it will be a wonderful journey for you. Plan your trip to fight a grand water flight on streets in Thailand? Be prepared and you will be the king of the battle! See How to Survive in Songkran Festival and What to Pack during Songkran Festival. Thai New Year is the largest water fight in the world that you can ever watch. If you are young or young at heart, you will love this. if you want to avoid to be wet, you can also find a lot to do during the celebrations of Songkran Festival. So, following are some other things that you can do to make the celebrations of Songkran Festival much more enjoyable. Thais believe that the new year can bring blessings and good luck for them if they are going to give food to the monks. They can provide them clothes, food or any other thing that can be beneficial for them. If you want to enjoy religious celebrations of Songkran Festival, a visit to different temples can be a better thing to do. You can find people performing religious prayers and giving bath to statues there. Holy buddha statues are brought out of different temples during the celebrations of Songkran Festival and paraded them through different streets with sparkling of water. Dancers and musicians can add more fun to these celebrations. Best celebrations of Songkran Festival take place in the northern side of Chiang Mai. In Chiang Mai you can find a beautiful mixture of different fun and traditional activities. You can see the immense water fight here as well as different Holy celebrations too. These Holy celebrations can demonstrate the religious importance of Songkran Festival. Songkran festival in Chiang Mai most commonly known as Paweni Pi Mai Muang. During the Songkran festival celebrations in Chiang Mai you can see the Buddha image and people giving bath to the Buddha images and people taking part in the parade with the sand and Sali, which are Bodhi trees and moving to the temples. 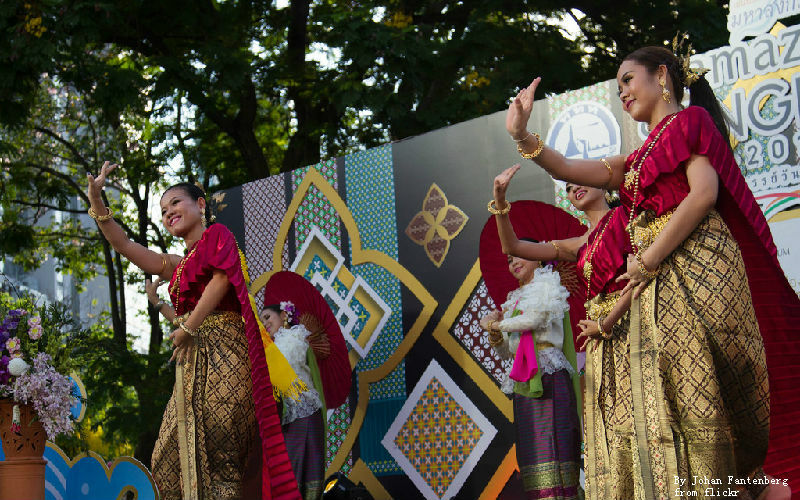 You can see many of cultural performance on different events during the celebrations of Songkran in Chiang Mai. You can enjoy a variety of Thai Cuisine there in retro Thai Lanna market of Chiang Mai. Songkran in Chiang Mai starts from April 13 and ends at April 15. Night in Chiang Mai during Songkran festival can be little dry, but you may find some crazy people enjoying with water at night too. UME Travel welcomes the chance to help you design your perfect trip to enjoy Thai New Year: Songkran Fesitval and the whole Thailand. Our specialists with first-hand knowledge will assist you in selecting destinations, accommodation and activities that best suit your requirements. Check out the following links to learn more about our Thailand tours and get a head start today on planning your hassle-free vacation!